Is your tennis demeanor more McEnroe-grumpy or Djokovic-cool? Put another way, do you lose it when another court’s errant ball bounces across your baseline, or do you smile and kick it back to its owner? Here, the six best courts in the city, keyed to the tennis personality they most closely resemble. W. 96th St. at Central Park Dr.; 212-280-0205The Wimbledon of public tennis, with 30 courts that attract die-hards who play every week (or day)—same time, same court. It’s pristine, beautiful, and walk-ons don’t stand a chance after 5 p.m. Reserve weeks in advance (on top of your permit or single-play pass, you need a $7 reservation ticket, available at the Arsenal or online). Attendants give away slots if at least two players aren’t present fifteen minutes before changeover. Never mind the Triborough Bridge racket, the slightly apathetic staff, or the small animal carcasses sometimes strewn on back courts (there is a hawk’s nest under the bridge). 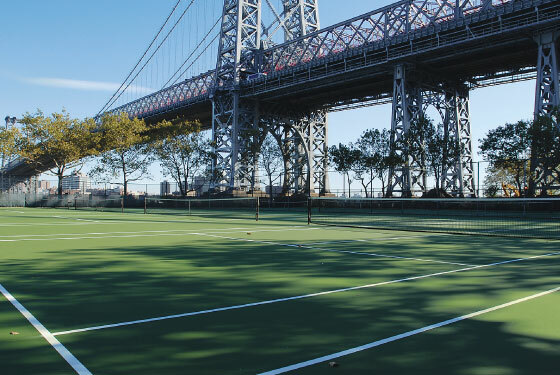 Astoria is beloved for its fourteen first-come-first-served hard courts, one of which is almost always available. Players, many of them Queens locals, are friendly, and the good ones can often find pickup games during the week. Playing here requires a high tolerance for interruptions, particularly on the first two courts—you can be mid-serve and kids will cut across on their way to lessons. Put up with it; the courts are beautifully maintained, slots are easy to reserve (have the $7 reservation ticket in hand before you call a week in advance), and the new 40 Love Café makes excellent smoothies. FDR Dr. at Broome St. 212-529-7185It’s unlikely you’ll find expert (or even high-level intermediate) players here—too many cracks on the twelve hard courts. So what; just look at those river views! Plus courts are easy to reserve; show up by 10 a.m., put your name on the list, then stroll several blocks west to the Clinton Street Baking Company for a coffee and mixed-berry scone until court time. The Riverside Clay Tennis Association (not part of the Parks system) takes good care of these ten red-clay courts. They open at 7 a.m. and sign-up is on a first-come-first-served basis for the next available slot. If you have a weekday off, play late morning and watch the elderly players’ perfectly measured strokes. Have a post-match beer and burger at the Hudson Beach Café about ten blocks upriver. Sequestered in the middle of a bird sanctuary that runs from 116th to 129th Street, these ten hard courts are immaculate and quiet—except when there’s a wild turkey gobbling past. Though the vibe’s definitely relaxed, hard hitters from Columbia University keep things competitive. It’s easy to just walk on during the week, but weekends, predictably, get busy, so arrive by 9 a.m.